Orlando Dugi (Diné [Navajo]), cape, dress, and headdress from "Desert Heat" collection, 2012. Silk, organza, feathers, beads, and 24k gold; feathers, beads, and silver; porcupine quills and feathers. 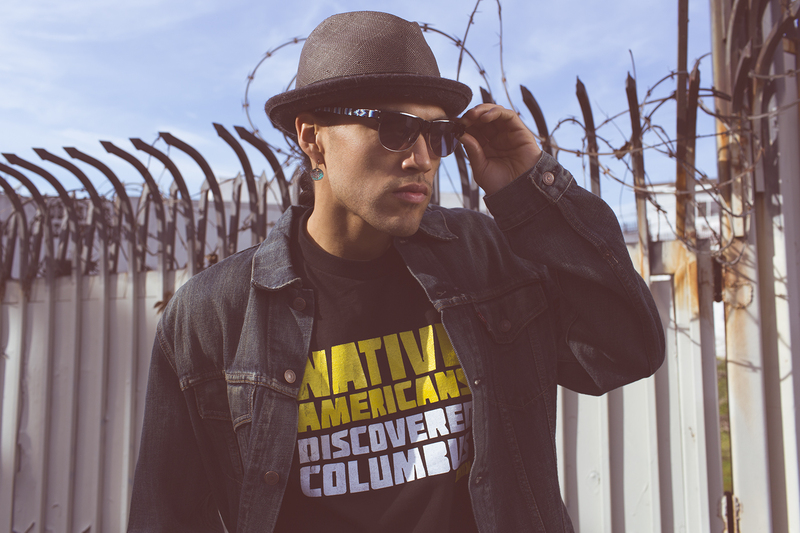 Jared Yazzie (Diné [Navajo]) for OxDx, Native Americans Discovered Columbus t-shirt, 2012. Cotton. Gift of Karen Kramer. Peabody Essex Museum, 2015.11.4. 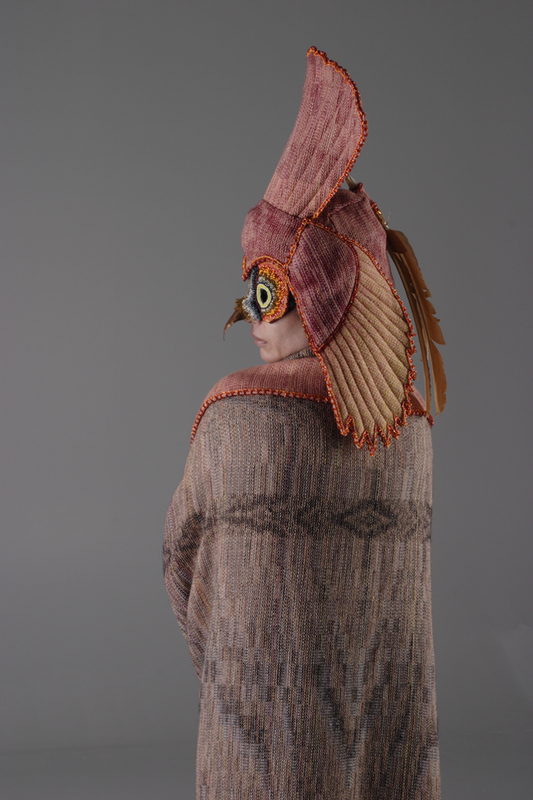 Margaret Roach Wheeler (Chickasaw) for Mahota Handwovens, The Messenger (The Owl) cape and headpiece, from the Mahotan Collection, 2014. Silk-wool yarn; silk-wool yarn, metal, silver, glass beads, and peacock feathers. Courtesy of the designer. Photo by Greg Hall. 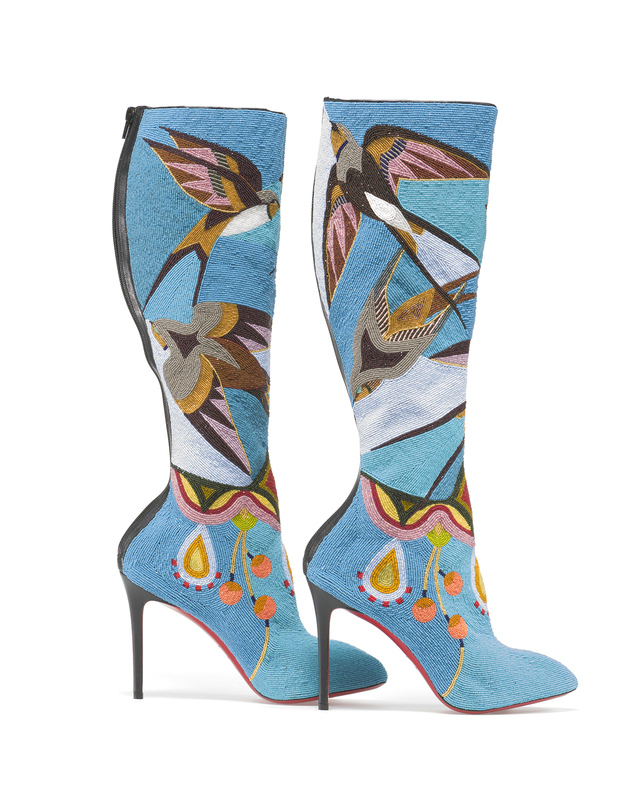 Jamie Okuma (Luiseño and Shoshone-Bannock), boots, 2013–14. Glass beads on boots designed by Christian Louboutin. Museum commission with support from Katrina Carye, John Curuby, Karen Keane and Dan Elias, Cynthia Gardner, Merry Glosband, and Steve and Ellen Hoffman.